A new Haskell library for mutable hash tables, which is several times faster than any previous Haskell associative array datatype. I’m very pleased to announce today the release of the first version of hashtables, a Haskell library for fast mutable hash tables. The hashtables library contains three different mutable hash table implementations in the ST monad, as well as a type class abstracting out the functions common to each and a set of wrapper functions to use the hash tables in the IO monad. Data.HashTable.ST.Basic: a basic open addressing hash table using linear probing as the collision resolution strategy. On a pure speed basis, this should be the fastest currently-available Haskell hash table implementation for lookups, although it has a higher memory overhead than the other tables. Like many hash table implementations, it can also suffer from long delays when the table is grown due to the rehashing of all of the elements in the table. Data.HashTable.ST.Cuckoo: an implementation of Cuckoo hashing, as introduced by Pagh and Rodler in 2001. Cuckoo hashing features worst-case O(1) lookups and can reach a high “load factor”, meaning that the table can perform acceptably well even when more than 90% full. Randomized testing shows this implementation of cuckoo hashing to be slightly faster on insert and slightly slower on lookup than Data.HashTable.ST.Basic, while being more space-efficient by about a half word per key-value mapping. Cuckoo hashing, like open-addressing hash tables, can suffer from long delays when the table is forced to grow. Data.HashTable.ST.Linear: a linear hash table, which trades some insert and lookup performance for higher space efficiency and much shorter delays during table expansion. In most cases, randomized testing shows this table to be slightly faster than Data.HashTable from the Haskell base library. People often remark that the hash table implementation from the Haskell base library is slow. Historically, there have been a couple of reasons why: firstly, Haskell people tend to prefer persistent data structures to ephemeral ones. Secondly, until GHC 6.12.2, GHC had unacceptably large overhead when using mutable arrays due to a lack of card marking in the garbage collector. kcount  :: !Int32,              -- Total number of keys. For now, let’s ignore the HashTable type, as it is essentially just an IORef wrapper around the HT type, which contains the actual table. The hash table from Data.HashTable uses separate chaining, in which keys are hashed to buckets, each of which contains a linked list of (key,value) tuples. To explain why this is not an especially smart strategy for hash tables in Haskell, let’s examine what the memory layout of this data structure looks like at runtime. 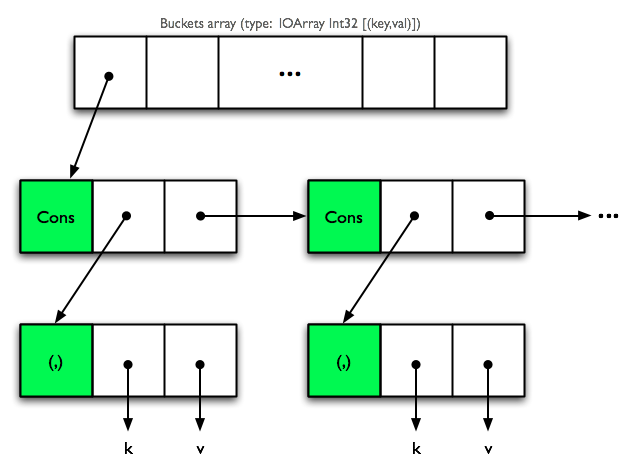 If the average bucket has b elements in it, the average successful lookup causes 1 + 3b/2 cache line loads: one to dereference the buckets array to get the pointer to the first cons cell, and 3b/2 to find the matching key in the buckets array. An unsuccessful lookup is worse, causing a full 1 + 3b cache line loads, because we need to examine every key in the bucket. one, maybe two, to find the correct hash code in the hash codes array. Note that since this is a contiguous unboxed integer array, a cache line load causes eight (sixteen on 32-bit machines) hash codes to be loaded into cache at once. one to dereference the key pointer in the keys array. one to dereference the key. one to dereference the value pointer in the values array. For the types we really care about (specifically ByteString, Text, and SmallString), the Eq instance is O(n) in the size of the key, as compared to the O(1) machine instruction required to compare two hash codes. 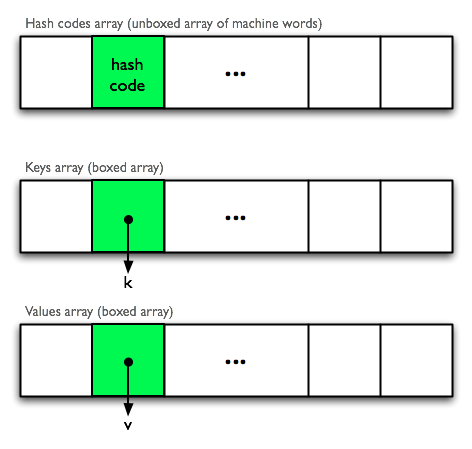 Keeping the hash codes in an unboxed array allows us to do super-efficient branchless cache line lookups in C. Moreover, we can take advantage of 128-bit SSE4.1 instructions on processors which support them (Intel chips, Core 2 and above) to make searching cache lines for hash codes even faster. I tested it both ways, and storing the hash codes was consistently faster. Unfortunately I cannot release the benchmark code at this time, as it relies on an unfinished data-structure benchmarking library based on criterion, for which I have not yet sought permission to open-source. The above procedure is repeated for a doubling set of values of N from 250 through to 2,048,000. Note that, to be fair and to ensure that random fluctuations in the input distribution don’t influence the timings for the different data structures, each trial uses the same input set for each data structure. We also force a garbage collection run between trials to try to isolate the unpredictable impact of garbage collection runs as much as possible. time how long it takes to load the N key-value pairs into the given data structure. Where applicable, the data structure is pre-sized to fit the data set (i.e. for the hash tables). Note here, though, that I’m not being 100% fair to Data.HashTable in this test, as the newHint function wasn’t called — when I tried to use it, the benchmark took forever. I’m ashamed to say that I didn’t dig too deeply into why. The benchmarks were run on a MacBook Pro running Snow Leopard with an Intel Core i5 processor, running GHC 7.0.3 in 64-bit mode. The RTS options passed into the benchmark function were +RTS -N -A4M. These are more or less the graphs I had been expecting to see. The main impact of setting -H1G is to reduce the frequency of major garbage collections, and the difference here would suggest that garbage collection overhead is what’s causing the poorer-than-expected asymptotic performance. The linear probing and cuckoo hash tables included in this library use very large boxed mutable arrays. The GHC garbage collector uses a card marking strategy in which mutable arrays carry a “card table” containing one byte per k entries in the array (I think here k is 128). When the array is written to, the corresponding entry in the card table is marked “dirty” by writing a “1” into it. It would seem that the card table is scanned during garbage collection no matter whether the array has been dirtied or not; this would account for the small linear factor in the asymptotic time complexity that we’re seeing here. While Haskell people prefer to use immutable/persistent data structures in their programs most of the time, there are definitely instances in which you want a mutable hash table: no immutable data structure that I know of supports O(1) inserts and lookups, nor is there an immutable data structure that I know of which can match a good mutable hash table for space efficiency. These factors are very important in some problem domains, especially for things like machine learning on very large data sets. The lack of a really good Haskell hash table implementation has been a sticking point for quite some time for people who want to work in these problem domains. While the situation is still not as good as it might eventually be due to continuing concerns about how the GHC garbage collector deals with mutable arrays, it’s my hope that the release of the hashtables library will go a long way towards closing the gap. The source repository for the hashtables library can be found on github. Although I’ve made substantial efforts to test this code prior to release, it is a “version 1.0”. Please send bug reports to the hashtables github issues page. A fellow by the name of Albert Ward has translated this blog post into Bulgarian.